Nineteenth century Britain saw the beginning of the mass media at its best and worst: novelists like Charles Dickens could become household names serializing their novels, a careless journalist could nearly inspire a pogrom by linking the ‘Jack the Ripper’ murders to London’s Jewish population. ‘If it bleeds, it leads’ was, like today, the ethos of the popular press; and if one of the many, many groups under the British Empire’s boot-heel could be demonized in the process, then all the better. The ‘Thugs’ of India were one such group, but they may have deserved the scorn: they are alleged to have killed anywhere between fifty thousand and two million people during a reign of terror that lasted hundreds of years. Operating all over the Indian sub-continent, the loosely organized fraternity of Hindus and Muslims were a feared and often respected ‘gang’, ‘tribe’ or ‘cult’ depending on who you asked. Operating alone or in groups, they would infiltrate caravans of traders or befriend travelers. Once they were trusted, they would strike, strangling a target with an easy to conceal garotte like a scarf or turban. The targets would be killed in remote areas, away from the rest of their group, while other Thugs would distract the larger group with music and dancing. A grave would have already been dug, so the Thugs’ targets would seem to simply disappear – eaten by wildlife or lost in the forest. By the time the disappearances became suspicious, it would be too late: the Thugs would outnumber them or could disappear with as much loot as they could carry. According to folklore, the Thuggee were devotees of Kali, the Hindu goddess of empowerment and wholeness, a complex figure who can appear to be macabre at first (wearing human skulls will give that impression). Her name literally translates as ‘the black one’, where ‘black’ refers to the nothingness that came before the universe was created. For this reason, she can appear, in some Hindu traditions at least, as the most essential of the gods, the one who comes before all others. Her metaphysical side is balanced by stories of her slaying demons and dancing drunk on blood until she almost destroys the universe. Since accounts of them first appeared in the west, the Thugs have been portrayed as fanatical cultists (see Indiana Jones and the Temple of Doom for a late example), criminals with no real interest in religion, or, most recently, a mix of both. Recent scholarship posits Kali-worship as a serious influence on the Thugs, even amongst its Muslim members, but this may have evolved as a tribal culture rather than being a founding principle. They were far too professional and well-connected to be a bug-eyed death cult, and were often financially linked to tribal leaders and the bureaucracy that was set up when India became part of the British Empire. This way, they were able to avoid reprisals for centuries. 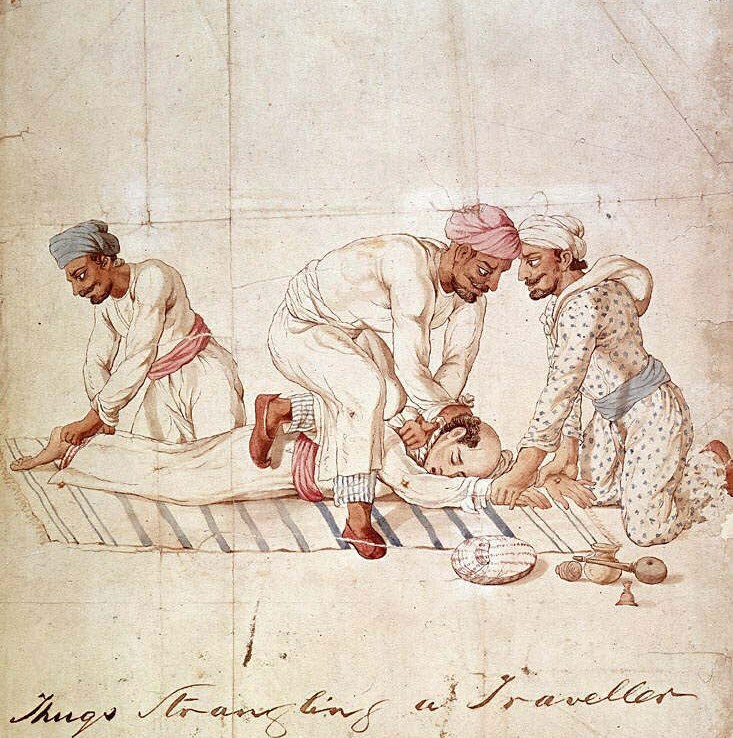 Stories of the Thuggee made their way out of the subcontinent in the early 1800s. Phillip Meadows Taylor’s book Confessions of a Thug was the first to popularize the group, and introduced the word into the English language. Tabloid stories followed, painting lurid pictures of dusky foreigners committing foul deeds in the name of their strange gods. Readers were fascinated by the story of Behram, a prominent Thug leader who reputedly strangled 931 men with a cummerbund bearing an ornate, and very expensive, Canova medallion. 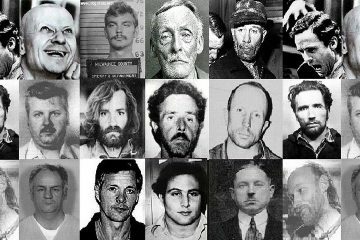 He confessed to strangling between 125 and 150, which stills makes him one of the most prolific serial killers in history. An ambitious British civil servant, William Henry Sleeman, saw an opportunity for advancement by tackling the Thugs. He made a name for himself by capturing Syeed Amir Ali, on whom Confessions of a Thug was based, and becoming head of the Thuggee and Dacoity Department, applying modern crime-fighting methods to the ancient problem. 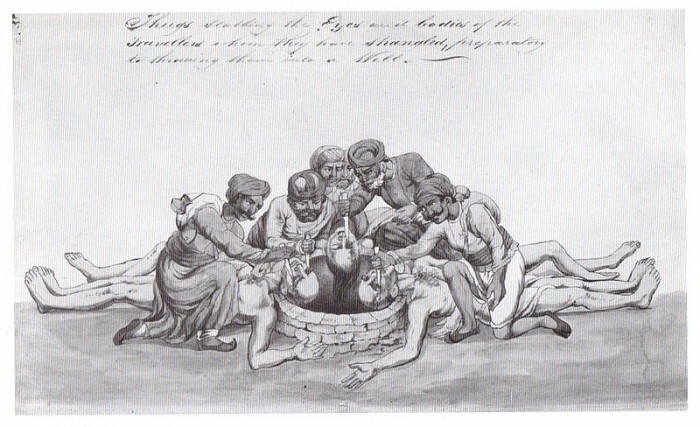 By collecting and circulating reports of Thug activity over all of British India and warning travelers of the Thugs’ techniques they turned the tables on the group, which had always worked secretly and with impunity. The department allowed the Thugs it captured to turn Queen’s Evidence, sparing their lives in exchange for information. 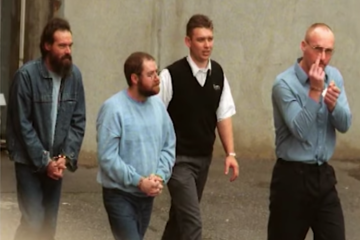 The tight-knit group of fanatics soon came apart when faced with the gallows. You can see in the department’s tactics a precursor to modern intelligence-led policing and even counter-terrorism. By 1870, the Thugs were extinct in India, but the Thuggee and Dacoity Acts that enabled the crack-down formed the basis of the Criminal Tribes Act. The act was based on the idea that if there were hereditary castes for priests, merchants and the like in Indian society, then surely there were hereditary criminals, of which the Thugs were just one example. The one-hundred and sixty tribes who were ‘notified’ of their criminal status were mostly nomads who didn’t fit the British ideal of what a ‘civilized’ culture should look like, whereas the Brahmins, Kshatriyas and others did (CVLT Nation featured a great documentary on Romani people in India, one of the many ‘notified’ tribes, here). The act gave the British government sweeping powers to arrest and harass the tribes, as well as justifying social-engineering measures like the forced movement of tribes to highly monitored villages and the removal of children to special schools where they were to be taught ‘civilized’ values (similar to what happened with the native populations of North America and Australia and the residential school system). This continued until India’s independence, but has left a legacy: the ‘notified’ tribes are now ‘denotified’ tribes and their sixty million members still face stigma and discrimination.